Attaching a T-shirt to a bottle of whiskey isn’t something that happens every day. 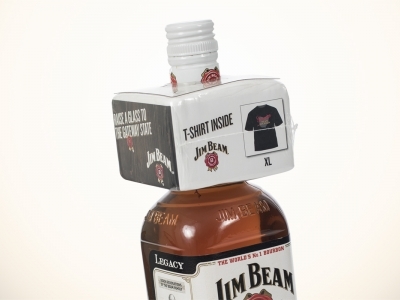 But when the creative people at Custom Stuffed Tees needed help securing a compressed T-Shirt to a bottle of Jim Beam Bourbon they came to Do-It Corporation. The shrink wrapped, compressed shirt is designed with a hole down the center to slide over the neck of the bottle. Do-It’s RAN Bottle Neck Hang Tab fits tightly over the cap and helps secure the package to the bottle. Now the T-shirt is less likely to be separated from the bottle before purchase.